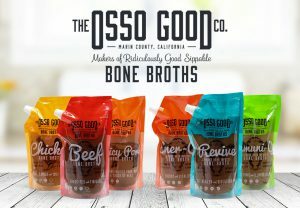 Bone broth cleanse to rule them all – Day 6 - The Osso Good Co. Bone Broth Cleanse Day 6: What’s stewing in my gut? Ah, day 6 of the Osso Good 7 day bone broth cleanse! Unlike no-eat cleanses or special powder detox cleanses or juice cleanses or the Lemonade diet, I am giving my body what I feel it needs and is relativity use to. That fact that I am actually eating substantial meals that keep my nutrient, protein, and vitamin intake up all while lowering the ingestion of foods that commonly bog a person down makes all the difference. By the same token, many bone broth cleanses promise you certain results and outcomes, but like just like healthy weight loss it comes over the course of weeks not days. In a few days I will share my results over the past week and over the next few months I will share what adding the best bone broth consistently in your diet can do for gut improvement, immunity enhancement, weight loss, and general health conditions I am attempting to curve that have plagued me over the past couple years. Indeed, I had the ole’ 15 oz. of Osso Good’s Chicken Bone Broth w/ coffee and leftovers for lunch. In all honesty, I really only have enough time in the day to make a single meal and that meal is usually dinner. However, I’m a sucker for breakfast and will have a paleo version of one of my favorite hispanic breakfast meals tomorrow. Furthermore, for lunch my wife made her favorite salad with greens, fruits, and nuts as a thanks for the picadillo. Greens are a regular staple in our household, even more so now that we are attempting to impress a certain diet on our child. Eventually, I felt the need to include some more fish into my diet during this Osso Good 7 day bone broth cleanse. I very often eat sashimi, sushi, and poke living in Seattle, but love the idea of a brothy fish stew. With any great stew, bread is a staple dipper to soak up the flavors, but as paleo alternative I love to make plantain slices. First, heat the oil in a very large pot over medium heat. Second, add the fennel, onion, shallots, and salt and saute until the onion is translucent, about 10 minutes. Third, add the garlic and 3/4 teaspoon of red pepper flakes, and saute 2 minutes. Then stir in the tomato paste, tomatoes with their juices, wine, fish stock and bay leaf. Then cover and bring to a simmer. Reduce the heat to medium-low for about 30 minutes. Finally, add the clams and mussels to the cooking liquid. Cover and cook until the mussels begin to open, about 5 minutes. Then add the shrimp and fish and simmer gently until the fish and shrimp are just cooked through, and the clams are completely open, stirring gently, about 5 minutes longer (discard any clams and mussels that do not open). Lastly, add seared scallops and season the soup, to taste, with more salt and red pepper flakes. First, preheat oil in a large, deep skillet over medium high heat. Second, peel the plantains and cut them in half. I slice the halves lengthwise into semi-thin pieces. The thicker you make them the more bread like and the thinner you make them, the more chip like. Lastly, fry the pieces until browned and tender. Drain excess oil on paper towels.